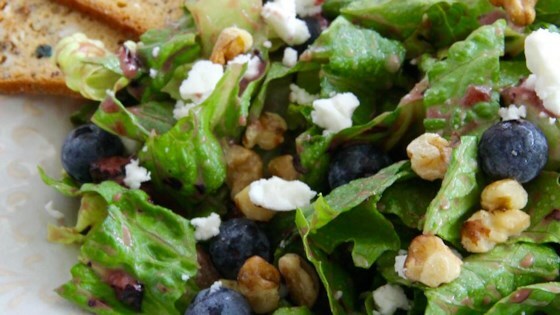 "Yummy vinaigrette dressing with a nice richness thanks to some balsamic vinegar and fresh blueberries! I prefer a little less oil for a thicker dressing and my husband prefers a little more oil for a thinner dressing." Combine oil, blueberries, white vinegar, balsamic vinegar, and honey together in a food processor; blend until smooth. Raspberry wine vinegar and Dijon mustard make an irresistible salad dressing. Frozen blueberries can be substituted for fresh blueberries. used EVOO and feels like the flavor competes with the blueberries, will try another oil like canola or grape-seed oil next time. I made this with frozen blueberries and it turned out great! Was so yummy. Made warm spinach salad with grilled chicken breast and sautéed mushrooms with some fresh blueberries on top. Dressing sooo easy to make and delicious! Will make again. Fantastic! I also used EVOO along with strawberry balsamic, white vinegar and honey. I cut this recipe in half for two persons and still had plenty for another salad or two. Very tasty. I made 2 changes, used 1/2 cup EVO and added 1 tablespoon of honey.